This type of punishment was derived from ancient Rome and is considered the most severe form of quartering. During the Middle Ages its use spread throughout Europe, invoking terror in criminals until the XIX century. The cruelty of the penalty was combined with the public humiliation of the offender. The body of the victim was tied to a horizontal-arranged wheel so that the head was turned up towards the sky, with the limbs resting on needles. Then the executioners beat the unfortunate soul to near-death with an iron bar. The bones in said limbs were crushed in two places, and two or three hits to the stomach and the bludgeoning of the backbone finishes off the procedure. 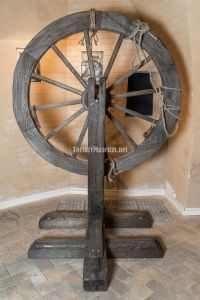 The offender, now thoroughly maimed, was place on the wheel in a way that his heels had come together at the back of his head. His bleeding body was left to die in this position. The agony could last several days, and the bodies were often fed to carrion birds. 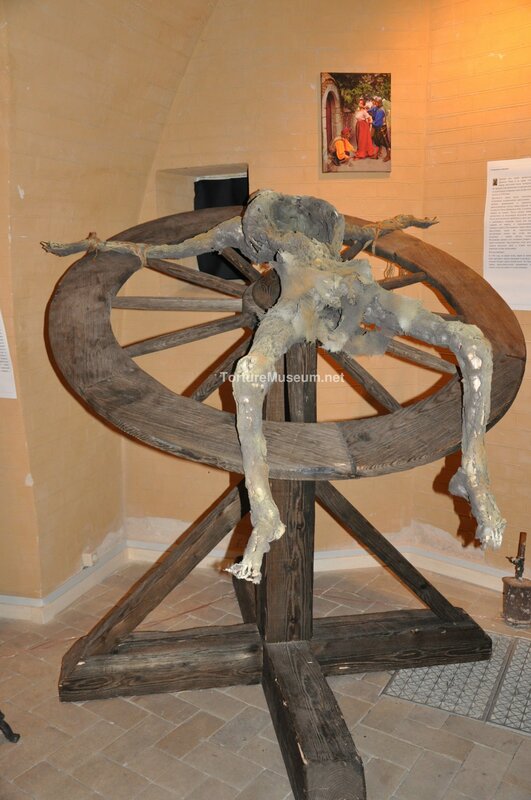 An interesting fact: In the year 1348, during the Plague, a Jew by the name of Bona underwent this punishment and was tortured for four days and four nights. It was the longest known survival of the Wheel in the history of its existence. 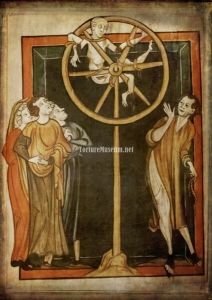 What kind of associations do you draw from the large, prehistoric wheel? 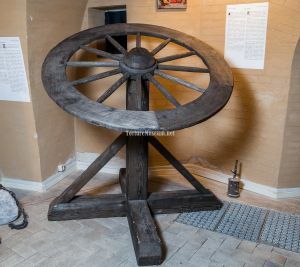 The water mill and the Ancient Roman chariot? Great. Now, what if I told you that it’s used for spectacular and painful torture? Picture this: Two convicts being lead into their place of execution. 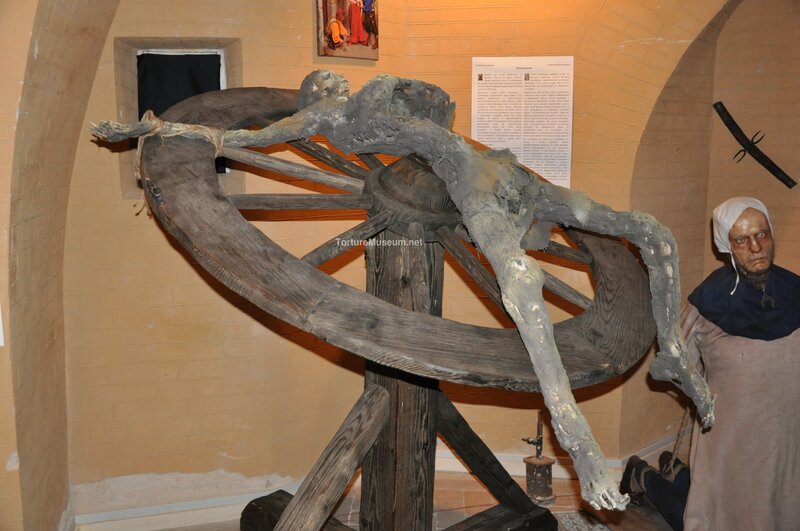 The first of them is tied onto a wooden cross, strong bars firmly pressed against his limbs and back. The executioner grabs a crowbar and unleashes a calculated blow to his victim’s thigh. A loud crunch is heard, and said leg becomes a bruised sack of fragmented bones. The rest of the limbs are also destroyed in similar fashion, not to mention the spine, sometimes up to waist-level. The criminal addresses the entire district with a mad howl, but the painful shock forces him to quickly quiet down to an intermittent croak. At the completion of all this, his fragile body is attached to a horizontally aligned wheel and left there until death arrives. His accomplice has already put the horror out of his mind, and only scratches at the ground with bloodied fingers. Not wasting any time, the executioners position a few thick bars underneath the man’s body, and with the help of ropes and stakes, they pin him down to the ground. They place the wheel vertically, and not even bothering to undo the corpse of the previous man, they roll him to the to the sound of outcries for mercy. Solid bars take apart thin legs, then the stomach, ribcage, and neck… A crescendo of cracking bones sounds under a crimson sky. In times when the executioner feels pity, he ceases the victim’s torture with a merciful blow of a hammer to the head.